Okay, weeks ago I stumbled into a Twitter conversation about public youth librarians taking vacation during the summer months. I've been wanting to write a blog post about it since then and since we're finalizing summer program dates this week, I thought it'd be a great time for this post. You earn that vacation time. I think that as long as you're vacationing responsibly (i.e. not taking six weeks off during the summer when it's your busiest time) you should take it when you want. Okay, okay, I know that summer has traditionally been seen as the bread and butter of the youth services world. The kids are out of school, summer reading club is going on, you're scheduling tons of programs and kids and families are coming in. It's not always the easiest time to get away. That said, I think most youth librarians can overthink this. And I think we're a conscientious lot (at least, if you're reading youth librarian blogs, I'm figuring that you're a conscientious librarian). And as long as you're planning ahead, there's no reason to deny yourself (or your staff!) all summer vacations forever and ever. You earn that vacation time. Your paid vacation time is part of your salary. In some library systems, your paid time off might be a significant part of your salary. You should be able to take some of that vacation time during the summer. And yeah, even if you're the only youth librarian at your library, I think that still holds true. It definitely calls for some planning ahead. I ask my staff to have penciled in summer vacation requests by March 1 so that we can plan our programs around when folks will be off. I know if I've got a couple of folks out, that's going to be a light programming week for us. And that's okay. Patrons understand staff taking vacations - lots of them are taking vacations throughout the summer, too. If you're concerned about giving them something to do, look into providing some passive programming while you're away. And simplify your summer reading club so that other staff can step in and help you if you need it. Now, to make this work during your busy season, it's perfectly reasonable to set limits for yourself and for your staff. I black out certain weeks when I know we're going to have a lot on our plate - the last week of school (tons of school visits) and the first week of summer reading club (busy busy in the department!). I ask my staff to keep requests to one week during the months of June & July. And if multiple people want the same dates, I may close those dates to additional requests off. Exceptions can certainly be made, but I set these ground rules so that everyone knows what my expectations are. If you truly, absolutely feel like you can't get away during the summer, even for a special trip with family who might only be available in the summer months, I think it's time to think about some balance. This year, my staff and I have increased our outreach to the schools exponentially and it's been extremely rewarding and also exhausting. So I don't feel like summer has to be completely over the top. I am hoping that this is going to be the easiest summer in a long time. And yes, I'll have some staff out on vacations at points during the summer. And yes, I will be gone for a week in June/July for the ALA Annual Conference. And we'll make it work. As we're finalizing dates for programs, I'm conscious of what our staffing levels will likely be at that point. 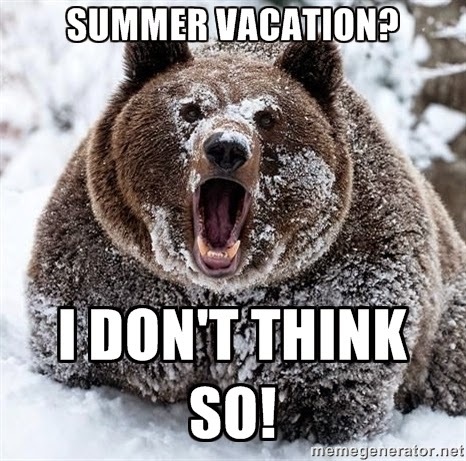 And yes, I too learned in grad school that no children's librarian would ever dare take vacation during the summer months and that August is for vacation-taking. But guess what? Our local schools are shortening summer break and our kids go back to school before August. August may no longer be a feasible time to take a family vacation. So, what say you? Are you ready to take the plunge, do your family or friends (and your work/life balance) a favor and schedule some vacation time over the summer?